Thank goodness canned goods have a long shelf life. You don’t want to know how old my can of cranberry sauce was! (Don’t freak out, I think I bought it last November or December…definitely not years old or anything) If you don’t have a bad habit of picking up canned goods and then storing them in your pantry forever, fear not…just head to the store and pick up a can of the whole berry sauce. I’m pretty sure you could also use fresh cranberry sauce, if you happen to have any frozen from Thanksgiving. The cheesecake layer in these is thin, but it’s just enough to complement the cranberry sauce. The crust is the star here—thick and full of oats and butter. Cut these small, and then eat five! Yum! 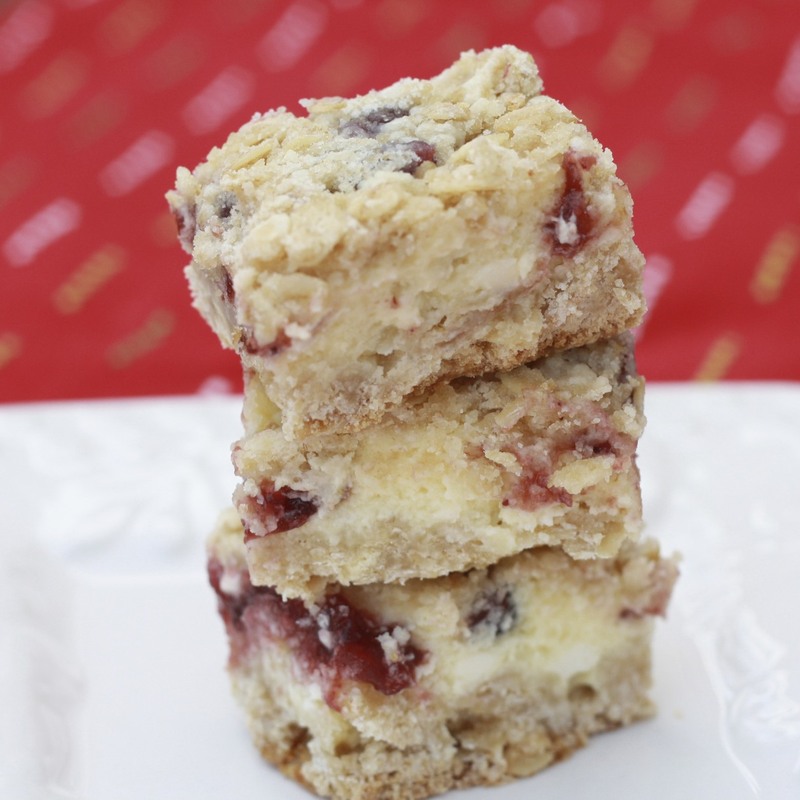 Looking for another holiday cheesecake bar that’s more about the cheesecake? 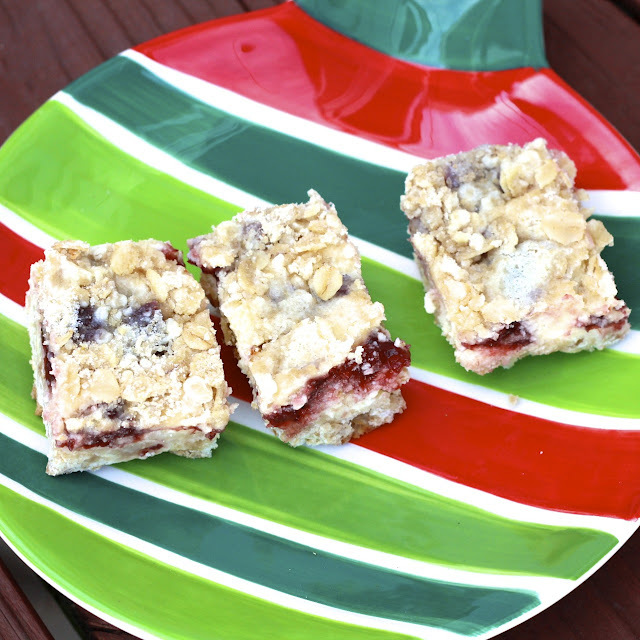 Try these Blushing POM Holiday Cheesecake bars, featuring a pomegranate juice glaze! 1. Preheat oven to 350F. Grease a 9 x 13 inch dish and set aside. 2. Combine flour, oats, and brown sugar in a large bowl. Cut in the butter with a pastry cutter until the mixture resembles coarse crumbs (I did this in my food processor but didn't add the oats until after). Set aside 1 1/2 cups of the mixture. Press the remaining mixture into the prepared pan. Bake for 15 minutes. 3. While crust is baking, beat cream cheese and sugar until light and fluffy. Add eggs, orange juice, and extract and beat until smooth. Spread the cheesecake mixture over the baked crust. 4. Combine cranberry sauce and cornstarch in a small bowl. Carefully spoon cranberry sauce over the cheesecake mixture (it will not cover completely, just drop spoonfuls all over). Sprinkle the remaining crumb mixture over the top. 5. Bake for 40 minutes, until set. Refrigerate for 3 hours or until completely cooled and firm. Cut into bars and serve chilled.